Yesterday the Senate Judiciary Committee held an important hearing entitled “Big Bank Bankruptcy: 10 Years After Lehman Brothers.” Originally scheduled for October, but postponed because of the debate over the Kavanaugh confirmation, the hearing concentrated on legislation that would create a new “Chapter 14” of the bankruptcy code under which large financial institutions could go into bankruptcy without spreading the crisis to the rest of the financial system. 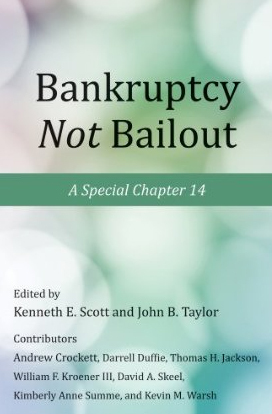 The idea came out of research by the Resolution Project at Stanford’s Hoover Institution, books such as Bankruptcy Not Bailout: A Special Chapter 14, and many suggestions, including by the witnesses at this hearing. The hearing was significant because there was so much support expressed in favor of Chapter 14. Here is a video and written testimony. All three witnesses—Donald Bernstein of Davis Polk & Wardwell, Mark Roe of Harvard Law School, and Stephen Hessler of Kirkland & Ellis—were basically in favor of Chapter 14. This support follows endorsement by the Administration in a thorough Report issued last February by the US Treasury. It also builds on unanimous support by the House Judiciary Committee after hearings held there last year. Significantly, most experts are now fine with passing Chapter 14 without also repealing Title II of Dodd-Frank. Repeal had previously been an impediment to bi-partisan support in the Senate. Now Title II can stay in the law, even if it will not be used much with Chapter 14 there. In any case, there is now no serious obstacle to passing Chapter 14 legislation, and while national attention on yesterday’s hearing was nowhere near that on the Kavanaugh hearings, the issue is no less important. As Emily Kapur shows in a counterfactual, having a Chapter 14 reform of the bankruptcy code could prevent the catastrophic meltdown experienced 10 years ago which devastated many people’s lives and left wreckage which we are still clearing up after ten years. This entry was posted in Financial Crisis, Regulatory Policy. Bookmark the permalink.